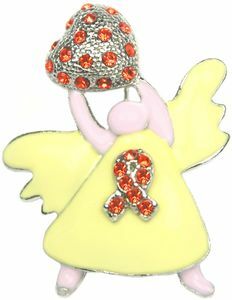 Leukemia Awareness Angel Pin: This classy orange heavyweight Awareness Angel Brooch features an angel holding a heart and wearing an orange awareness ribbon. This Awareness angel brooch is plated in silver and includes a locking brooch pin back. It's a great gift. Locking Brooch back for extra security. Make sure to see our full selection of Leukemia Cancer Awareness products for more great ideas and gifts.